Rob Cross occupies second place in the Premier League table only two points behind Michael van Gerwen. He is five points clear of fifth placed Daryl Gurney, though Cross has played one match more than the Northern Irishman. He earned two points from his two matches on Wednesday evening, having defeated Daryl Gurney 7-4 and then lost 7-3 to Gary Anderson. His performance on the doubles on night 11 was below the high standards he had been setting in previous weeks. The combined checkout percentage for Voltage against Gurney and Anderson was 31%, whereas his combined checkout percentage over his previous seven matches was 60%. Last night in Rotterdam, Peter Wright stunned the league leader Michael van Gerwen for the second time in the 2018 Premier League when he defeated the world number one 7-5 in front of a fervent Dutch crowd. The win against Van Gerwen was only Wright’s third match win in the 2018 Premier League, with two of those coming against the game’s greatest player. Wright has now won back-to-back matches in the Premier League for the first time this season and he was lost just one of his last five matches in the tournament. Despite this, his aspirations of a top-four finish look very slim, Snakebite is currently eighth in the table and a total of four points behind fourth-placed Michael Smith with a huge leg differential also a factor. 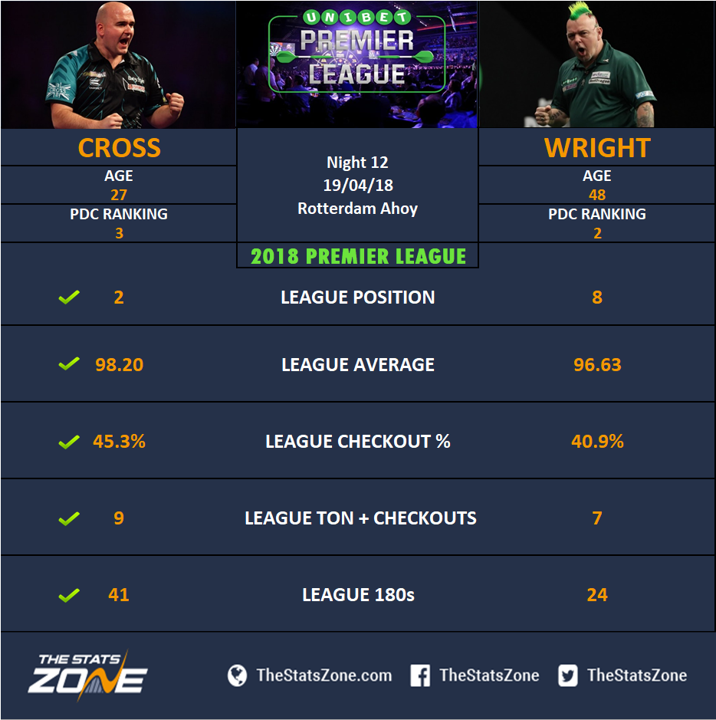 Rob Cross has enjoyed a much better Premier League season overall than Peter Wright as is shown in the league table, but the fact that Wright has beaten Van Gerwen twice highlights what a threat he is to any player in the tournament. Consistency has been a big problem for Snakebite during the campaign and that is why he finds himself adrift of the play-off places. Cross has won each of their last three meetings and starts as the favourite but Wright will be on a high and will relish the opportunity to prove he can overturn the odds for the second night in a row. It’s a tough match to predict and a lot does depend on which Peter Wright turns up. An entertaining draw is the predicted outcome.